My grandpa: so you have a degree in religion, did something-something with computers for a while and now you’re opening an art gallery? My grandpa: so you have a degree in religion, did something-something with computers for a while and now you’re opening an art gallery? Yup – that pretty much sums up the last 14 odd years of my life. I left my comfy corporate downtown job to pursue my passion in photography. For the time being that is, because nothing is permanent, not even dreams or passions. But since the worst regrets always tend to be for things you didn’t do, I decided to give it a serious shot at the very least. So all of a sudden I went from being a celebrated “management consultant” (I imagined they threw a party whenever I left a project) to “artist”. No need to wear a suit, or shave, on most days. It’s all been more or less inspired by a feeling gnawing at my insides for years, and then put into action by a book called “The Escape Manifesto”. The executive summary: I read it in two days, and left full-time corporate employment the third. So now I’m an “artist” they say. I’m still not sure what that means exactly. Living the dream, I guess. Which is actually not that hard. Walking through the revolving door of some corporate office after the last day on a project to pursue another dream turns out to be easier than you might think. Dreams are free. I’m having fun doing what I do on most days, and get to go skiing (or ride my motorcycle, depending on the season) on the days I don’t enjoy what I’m doing and in doing so still enjoy what I do that day. All things considered, that’s pretty awesome. That being said, always (always!) read the fine print. Because while dreams are free, the hustle is sold separately. Walking through the revolving door is the easy part, what comes after isn’t. Trying to build something out of a dream is really hard work, beyond your wildest imaginations. I learn more every day than I care for, because around every corner there’s some surprise waiting, some challenge I’ve never dealt with before. Simple things like throwing a party usually turn out to be a lot more complicated than they seemed, or needed to be. I learned that the hard way, two hours before cutting the proverbial ribbon. Luckily a credit card number makes most obstacles disappear. And it ends unpleasant phone conversations from impatient important people who think you’re doing it wrong. But that’s not how it’s supposed to be. Obstacles like seemingly “important” paperwork and people are part of the hustle experience, and they need to be dealt with appropriately, in a timely fashion. Not by a swipe of plastic credit. The hustle really is sold separately. It’s also a great opportunity to put my stubbornness to good use. Hadn’t I been so stubborn, I would have thrown in the towel long time ago. As Bethany says in the movie Soul Surfer – I don’t need easy, I just need possible. And that’s pretty awesome. And a rewarding way to make a life, I think. Curious to read more? 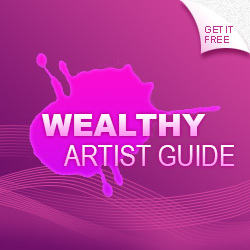 Check out my new e-book The Wealthy Artist: The Common Sense Guide to Finding Success as an Artrepreneur.